The Mays Raiders are off to a 3-1 start and 3-0 in one of the toughest region in the state of Georgia in Region 6-5A. A week removed from ending his former school ML King’s 19-game region winning streak, head coach Corey Jarvis and his Raiders downed Southwest Dekalb 43-24 on Friday. 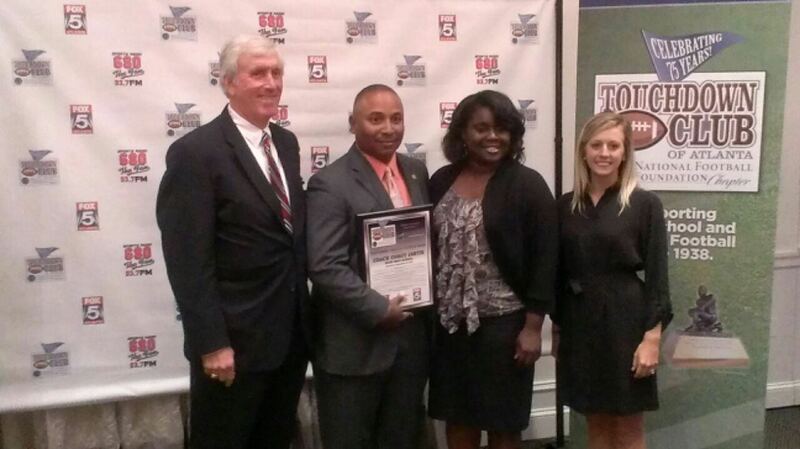 On Monday Jarvis was named the Touchdown Club of Atlanta’s Coach Of The Week for his teams efforts against ML King. In his first season leading the program Jarvis has quickly brought Mays into the region title contender conversation along with Tucker-ranked No.1 in Class 5A, Stephenson-ranked No.2 in Class 5A and ML King. The unranked Raiders are averaging 31 points a game while allowing 19.5 a game. 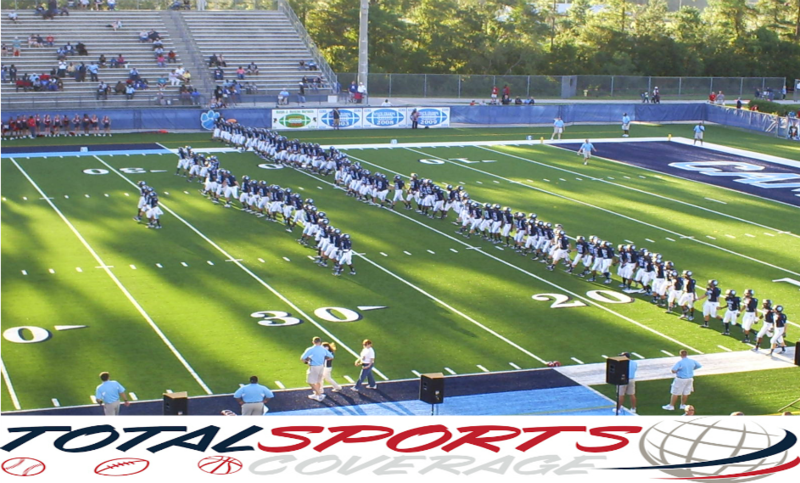 Their lone loss came in the season opener against Carver-Atlanta 20-19. One of the most talented running backs in the state of Florida and the nation brought his game to Marion County and left many in attendance shaking their heads in awe of his ability. Scarbrough, a four-star prospect by recruiting services is committed to Alabama, said afterwards that Florida State is still highly interested. Scarbrough rushed for 170 yards and four touchdowns of 24, 24, 7 and 44 yards in the win over Trinity Catholic. Trinity Catholic got off to a nice start with a safety but from there it was mainly Scarbrough and IMG lighting up the scoreboard putting up 33 unanswered points before Trinity Catholic would score again, they led 20-2 at the break. Scarbrough had plenty of help as four-star quarterback Mike O’Conner (verbal to Penn State) tossed the ball around the yard for 186 yards and two touchdowns despite a low completion percentage of 35%. Trinity Catholic would hang tough despite being down and only converting on four-of-fourteen third downs on the night. Quarterback Reid Carlton passed for just under 200 yards while tossing two touchdowns to Rudi Outar and Dominique Brown. The Celtics also got a solid rushing effort from Johnny Taylor and Mark Franklin. Taylor and Franklin combined for 150 yards rushing on the night but IMG was too much dowing the Celtics 47-23. IMG Academy is not your grandfathers high school. The Bradenton, FL boarding school gains national attention with plenty of high level recruiting prospects such as Scarbrough, it’s training facilities and athletic camps for both youths and adults. IMG has ten players in this years 2014 class that recruiting services are tracking and expect to have a big signing day come February. Trinity Catholic (3-1) will look to rebound this week on the road against Clearwater Central Catholic (3-1) who is coming off of a 49-0 win over Stonecrest Prep. IMG Acdemy (4-0) will look to remain undefeated when they face First Academy (3-1) out of Orlando. The weather is slowly turning to fall and the parks are ready to fill up with softball action. Entering their fourth season, Wrigley Field Adult Co-Ed Softball Leagues will be getting underway this month. Team and individual registration began on Monday Sept 16th. The fee is $12 per player and there is a team limit of 14 players per team. Grab your glove, bat, cleats, Gatorade and call your buddies and get out there and play some softball. For more information please contact Danny Smith at 352-671-8560 or you may email him at danny.smith@marioncountyfl.org. The Oklahoma Thunder added another minor league football trophy to their case with a convincing 56-8 victory over the Lehigh Valley Storm in the Girdiron Bowl IV in Memphis, TN. It was the Thunder’s first ever Gridiron Developmental Football League National Championship who were World Bowl champions three straight years in 2008, 2009 and 2010. Oklahoma made their second appearance in the GDFL championship game and left their mark in a major way with the sound defeat of Lehigh, who were making their first ever appearance in the championship game. The Thunder finished the 2013 GDFL season undefeated at 11-0 scoring 50 or more points in five of their eleven games. Oklahoma averaged 47.0ppg while allowing 9.27ppg with five shutouts and improve to 77-4 all-time in minor league football action since they began play in 2008. Leading up to the title game the 2013 Keystone Division and Xtreme Conference champion Lehigh Valley Storm camp were vocal about seeking respect and lack of it heading into the title game against the proven Thunder. The Storm finished 8-3 in 2013 and will go back to the drawing board to right their errors for the 2014 season. In the title tilt they were held to their lowest scoring output of the season and suffered their worst defeat of the season to the tune of 48 points. The Storm opened and closed their season with blowout losses to GDFL championship teams, losing in the season opener 42-0 to the 2012 GDFL National Champion Central Penn Piranha. Combined the Storm were outscored 98-8 against the last two GDFL champions so improvement is in order. Prior to the national championship game, the GDFL held the Hype Bowl between the Memphis Blast and the Georgia Firebirds. The Blast defeated the Firebirds 14-0. Southern Hospitality went several ways as a near capacity crowd filled the 4,500 seat Georgia State University Sports Arena for the 8th Annual LudaDay Weekend celebrity basketball game. Cheering for their favorite celebrities and watching NBA players this crowd got their monies worth and some as Team Usher defeated Team Luda 100-91 in overtime. The game was the highlight of a charity weekend serving as a fundraiser to give back to the Atlanta community through The Ludacris Foundation. From those in the musical industry to professional basketball players and radio personalities they all laced it up to raise funds. Ludacris addressed the crowd afterwards thanking them for attending and announced that $20,000 was raised by The Ludacris Foundation. As expected the laid back easy atmosphere game was filled with laughter, off-the-glass fastbreak dunks, failed alley-oops, long ill-advised three-pointers, non-pro players seeking a highlight and fun bragging rights. However as the game remained close, it quickly turned into a highly competitive contest in the second half. The juices began to flow from the NBA players on each team and their respective coaches, Usher and Ludacris including their teammates on the sidelines. Trialing by three with 5.7 seconds left in the second half, Team Usher’s Raymond Felton of the New York Knicks dimed it off to Jarrett Jack of the Cleveland Cavaliers in the left corner for a three-pointer tying the game at 84 with 2.4 seconds left. After a timeout Team Luda’s John Wall missed a long three-point heave sending the game to overtime for the first time in its history. In overtime Team Usher outscored Team Luda 16-7 pulling away in the final minutes for the win punctuated by a right corner three-pointer by Jack. Jack turned to the crowd celebrating in front of the Team Luda bench after he released it before it hit all net in the closing moments. Team Luda led at halftime 34-31 after coming back from 12 down earlier in the half behind Phoenix Sun Shannon Brown’s nine points. Brown is the husband of Atlanta musical artist Monica. Jack, a product of Georgia Tech, lead all scorers with 42 points (32 in the second half) hitting eight three pointers. Raymon Felton finished with 21 (13 in the second half), Kenneth Faried of the Denver Nuggets put in 15 (11 in the second half) and the only WNBA player to participate, Angel McCoughtry of the Atlanta Dream had five in limited action for Team Usher. John Wall of the Washington Wizards led Team Luda with 34 points, 28 coming in the second half. Brown dropped in 23, 14 in the second half, while Riverdale (GA) high school alum Josh Powell, who last played in the NBA with the Atlanta Hawks during the 2010-11 season, booked 13 points. Military vet, Florida State alum and former Dallas Maverick Bernard James tallied 10 points. Known for his time on the And1 Mixtape Tour, Hot Sauce led all non-NBA/pro players with seven and was on the floor late when the competitive juice were flowing and the game was in the balance. Hot Sauce displayed the wickedest dribbling exhibition when he crossed up Atlanta’s V-103 afternoon DJ and former BET Rap City host Big Tigger in the first half draining a trey ball after Big Tigger was long gone. Prior to the game Big Tigger tripped out with V-103 talent on a bite about his Jordan’s, it wasn’t the shoes in this case. Team Luda reality TV star Laura Govan also had a first half highlight when she went between her legs several times and spun in the lane for the hoop and the harm, she was guarded by and fouled by Bambi of Basketball Wives LA. Govan swished the free throw to complete the three-point play for her only points of the game. Bambi did not play in the second half and did not score in the game. The Sports Utility Vehicle webcast the game live and the archive of the event can be viewed here. Based out of little Gadsden, Al the Alabama Trojans capped their 2013 summer season with a thrilling victory over the Georgia Falcons to win the Heart Of The South Championship. For head coach Mario White it capped his career in minor league football as confirmed after the game that he is walking away from the minor league football game. The Trojans had to come from behind to send their coach out on top. Trailing 19-13 entering the fourth quarter after Champ Tarver scored on touchdown runs of 2 and 59 yards for the Falcons in the final 3:25 of the third quarter Alabama used their defense to take the lead. On the opening play of the fourth quarter Trojan quarterback DJ Smith was intercepted at the Falcons twenty yard-line yet on the very next play defensive lineman Brian Caldwell stripped Falcons running back Aaron Palmer and returned it 19 yards for a touchdown. The Trojans converted the two-point conversion and lead 20-19 with 14:27 remaining in the game. The Falcons were unable to move it on their next possession and had to punt, giving the Trojans the ball on their own 19 and they moved it on the ground to the Falcons 43 eating much of the clock before having to punt it back. Georgia again was unable to move it coming up two yards short on a fourth down and thirteen and the Trojans ran the clock out from there earning the 20-19 victory. “I told the guys I wanted to go out like Ray [Lewis] and when we got down I just told them we had to stay composed and keep the family atmosphere that we’ve had all season. The defense rallied after the pick and B [Brian Caldwell] made a play and we pulled it out, we’re going back home to Alabama with the trophy,” Mario White said. Following a missed field goal by the Falcons, Alabama scored on their opening possession when Smith hit Cavaris Lanier on a 32-yard touchdown pass on a busted play for a 6-0 lead after a missed extra point capping the 5-play 72-yard drive with 3:50 left in the first quarter. The Falcons answered back on their ensuing possession going 55 yards in three plays scoring on a 14-yard touchdown pass from minor league football veteran quarterback Darick Tinch (Forest Park Vikings, Henry County Horsemen) to Brandon Conerly tying the score 6-6 with 1:39 left. Each team committed a turnover and punted before Smith and Lanier hooked up again on a 37-yard touchdown pass with 2:11 left before halftime. White goes out coaching two teams from Gadsden that won championships in recent years. In 2011 he won the NDFL championship with the Alabama Bengals and the 2013 Heart Of The South Championship with the Trojans winning both against Georgia opponents in the state of Georgia. “I feel like a million bucks,” White said after addressing the team and taking several photos with players and friends after the victory. White acknowledges that he would take on an advisory role of sorts but would not return to coaching unless it’s a “perfect situation”.